Aim and Objective: The present study was performed with the aim to develop an efficient and environmentally benign protocol for the synthesis of biologically siginifcant 3, 4-dihydropyrano[c]chromenes using a new catalytic material. The protocol involves the use of a reusable, environment friendly materials and solvents with operational simplicity. Materials and Methods: Carbon microsphere supported copper nanoparticles (Cu-NP/C) prepared from loaded cation exchange resin were synthesized, characterized with well versed analytical techniques such as XRD, SEM and Raman spectroscopy and the synthesized material was used as a catalyst for the environmentally benign synthesis of 3,4-dihydropyrano[c]chromenes. Results: The formation of carbon microsphere supported copper nanoparticles (Cu-NP/C) prepared from loaded cation exchange resin was confirmed by XRD, SEM and Raman spectroscopy which was employed as a heterogeneous material for the synthesis of 3,4-dihydropyrano[c]chromenes. The products formed were characterized by the analysis of spectroscopic data - NMR, IR and mass. The safe catalytic system offers several advantages including operational simplicity, environmental friendliness, high yield, and reusability of catalyst and green chemical transformation. 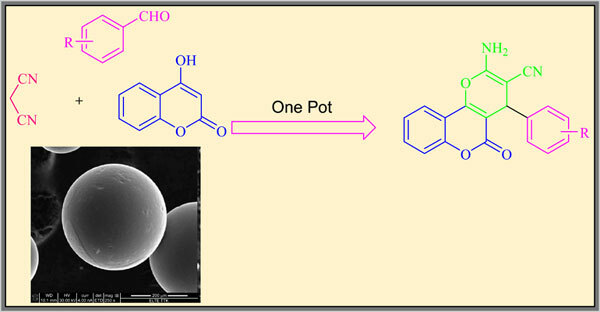 Conclusion: Herein we report an easy and efficient protocol for the one-pot synthesis of dihydropyrano[ c]chromenes using environmentally benign MCR approach in ethanol as the green solvent. The method developed herein constitutes a valuable addition to the existing methods for the synthesis of titled compounds. Cu-NP/C, dihydropyrano[c]chromenes, multicomponent reaction, catalyst, green solvent, one-pot synthesis.